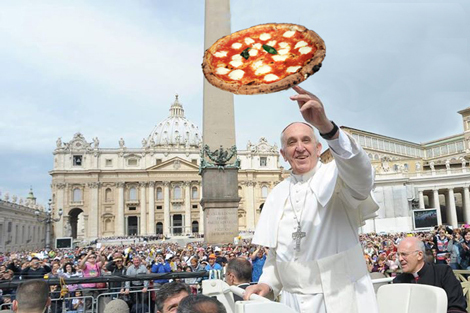 Even when you’re the leader of the world-wide Catholic Church, sometimes you just crave the simple things in life—like pizza. That’s what we learned a couple weeks ago during an interview with Pope Francis, who revealed: “The only thing I would like is to go out one day, without being recognized, and go to a pizzeria for a pizza.” Cruising the city in the popemobile is a dead giveaway, after all. But when arguably the most famous #pizzaboy sends signals of distress, you can be sure that his band of brothers will respond. Case in point: yesterday, Pizzeria Don Ernesto’s owner Enzo Cacialli jumped over a barricade to hand-deliver a personalized pizza—”a Naples-style thin crust creation with “Il Papa” spelled out in dough and topped with yellow cherry tomatoes, a reference to the Vatican flag,” according to CNN. Forget Ellen’s stunt at the Oscars: This may go down as the single most clutch hand-off in the history of pizza delivery.